Fresh news comes from the Dutch yard Wim van der Valk announcing the construction of their future flagship, a 30m raised pilothouse motor yacht. Coming from the Continental III series, this all-aluminium motor yacht has an exterior and an interior design by the yard team in collaboration with Guido de Groot. Accommodation is for 10 in five cabins on the lower deck: a full-beam master, two doubles and two twins. Crew quarters, forward, are independent with their own exterior access. Lloyd's registered and MCA compliant, this motor yacht is powered by quadruple 667kW Volvo Penta IPS engines giving a top speed of 25 knots. 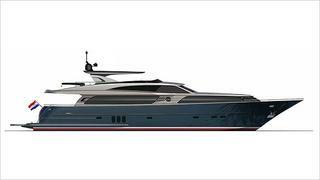 The construction of the 30m Continental III will start soon, and her launch date is scheduled for summer 2014.